The album was released as both a compact disc as well as a double vinyl. The band embarked on a worldwide tour entitled “The Home Front Tour” throughout the entirety of 2008 in support of Brighter Than Creation’s Dark. 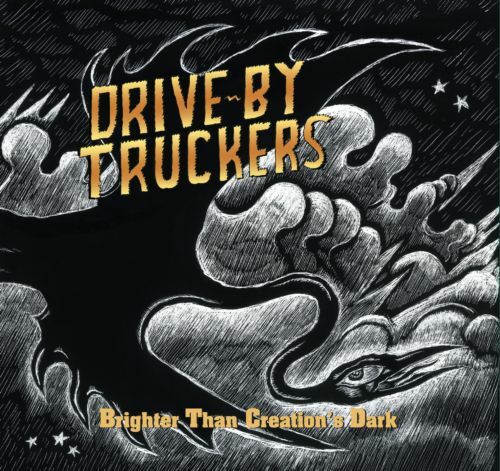 Many people feared that Drive-by Truckers wouldn’t be able to handle the departure of Jason Isbell, but even if he was (and is) a tremendously gifted artist, DBT is foremost the band of two other equally gifted singer/songwriters, Patterson Hood and Mike Cooley. And this album is proof that they could manage very well without Isbell. Brighter Than Creation’s Dark contains some of the band’s best work to date. The lyrics are exceptional, especially on The Home Front and That Man I Shot, both about the war in Iraq directly or indirectly. Patterson Hood is a great storyteller and he’s not affraid to go into the murky areas of the mind. What’s more is that Shonna Tucker stepped up both as a singer and songwriter. She has three songs on the record, the best of them beeing the magnificent The Purgatory Line. It is a long album, but has three very good songwriters who oozes confidence and willingness to show what they can do. 19 interesting stories about people.